Would-be operators, Stagecoach could terminate its involvement in the delayed Sheffield-Rotherham tram-train project, Rothbiz has learnt. The £60m pilot project, first mentioned in 2009, will see vehicles running on both rail and tram networks, using the freight route from Rotherham and then joining the Sheffield Supertram network at Meadowhall South. The project has been delayed a number of times as Network Rail get to grips with some of the heavy rail modifications, including power, track modifications, approvals and testing and commissioning. Network Rail has confirmed its reviewed timetable with the Government and the service is now expected to begin in Summer 2018, but papers to the Sheffield City Region Combined Authority reveal that contracts signed in 2012 include a "long stop date" of September 15 2017, which allows any partner to walk away if services are not underway. 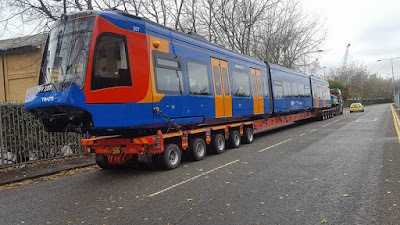 Stagecoach, which operates the current Supertram system in Sheffield, is currently reviewing its commercial operating contract regarding tram-train. The concession for running the Sheffield Supertram ends in 2024. The city region is hoping to secure Government funding for refurbishment that would ensure that it could run for another 30 years. Opened in 1994, the system cost a reported £240m and now serves major residential and employment sites in Sheffield. Extending the network, the Department for Transport (DfT) is the client in the tram-train project, with South Yorkshire Passenger Transport Executive (SYPTE) responsible for the delivery of all of the light rail modifications, rail replacement and procurement of the seven vehicles. Network Rail is separately responsible to DfT to deliver the heavy rail modifications required for the project. With funding from the Government, the £60m scheme is set to run for two years with a view to permanent operation. It is the first of its kind in the UK and if it is successful, it opens the way for tram trains to be introduced in other parts of the country. The paper to the Sheffield City Region Combined Authority Transport Committee, explains: "The delays experienced by Network Rail have thrown up other issues, the main one being that all the contracts contained a long stop date 15 September 2017, allowing any partner a mechanism to terminate their involvement if the service was not operating by that date. "This date will clearly not be achieved and this has allowed Stagecoach Supertram to review their commercial operating contract. This matter is presently being negotiated with SYPTE and DfT." The latest progress on the project includes physical work by Network Rail on the new stop at Parkgate and on the track known as the Tinsley Chord. The SYPTE has taken delivery of all seven of the new vehicles and testing, commissioning and driver training is underway. Work is also progressing on a potential stop at Magna and Templeborough with engineering feasibility work taking place. Early indications are that an additional stop at Magna could be included within the proposed timetable.